It is day three of hiking, and Birch and I have hit our stride. This hike was very easy and – to be perfectly honest – a bit boring. 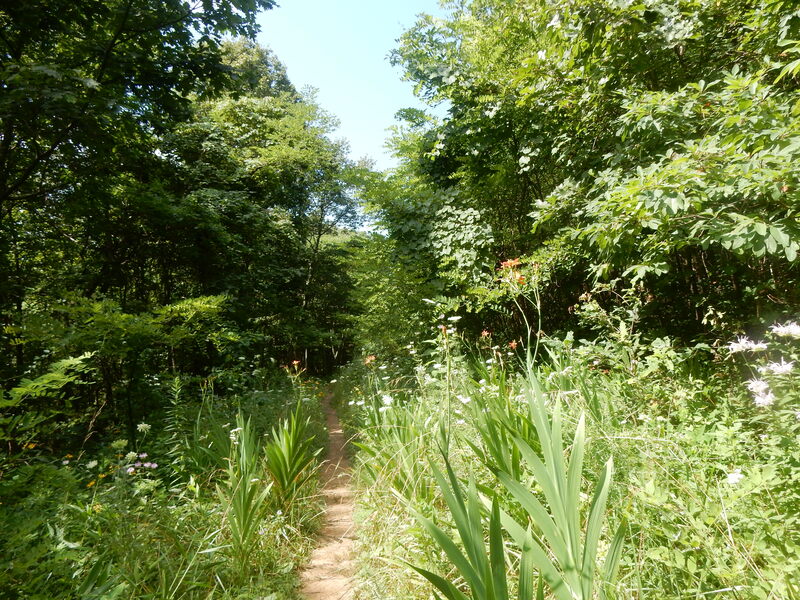 The trail is lined with mountain laurel, rhododendrons, and ferns. The train itself is wonderfully smooth. After a short ascent we were fortunate to have a 3-mile descent. That was very unusual and very much appreciated. The only challenge was that, being the first on the trail, I was ensnared in quite a few spider webs. Along the way we came across another area where a fire had occurred, long ago. It is so neat to see how resilient a forest can be. While there were not many tall trees, there was plenty of new growth. My favorite part of the trail was at mile seven, when we came across a section of the trail blanketed in wild flowers. The butterflies were numerous and too busy tapping the flowers to worry about a couple of hikers. This entry was posted in Maple's Jots on Jaunts, Shenandoah, Virginia Hikes and tagged Appalachian Trail, Day Hike, day hikes, hiking, Shenandoah, Shenandoah National Park, virginia hikes, weekend hikes by Maple. Bookmark the permalink.